to write Mary’s monster half as good? towards such as he, or Jimi Hendrix. of genius drowned. As if she were thick! Yes, in our hearts, we opt for glory. Polidori was Byron’s doctor, who accompanied the poet to the villa he rented near Lake Geneva, where he hosted his friends Mary and Percy Shelley. * They read ghost stories and composed their own. Mary came up with the idea for Frankenstein, and Byron wrote a fragment of a vampire novel. 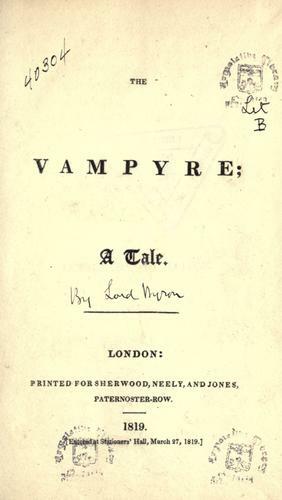 Polidori wrote the first full length vampire story written in English. When published it was attributed to Byron, who denied authorship. It is still listed as written by Byron in various catalogues. You can see how keen someone was to attribute it to Byron in the image above! My poem above is, to some extent, about our tendency to feed upon the ‘young and beautiful’ after they die, at least. Poor John Polidori died very young himself, like Percy Bysshe Shelley and Byron. He was best known for who he associated with; a groupie, not a musician. There is some evidence that he committed suicide, but this is controversial. The poem deals with the way that most writers, whether poets or novelists, far fall short of the Shelleys or Byron, and most musicians are not Hendrix. That does not mean that nothing worthwhile can be written by those ‘silver poets’. It just means that some people seem blessed with an additional talent to take what was around and transform it into something instantly recognisable as new. A glamour, perhaps, to use that word in an old way meaning spell or magic. A blessing is another word that could be applied. Some use the word ‘genius’, and surely that reminds us of something magical, that grants wishes? Next year is the 200th anniversary of that meeting on the shores of Lake Geneva, and I hope to write a lot about Frankenstein and his monster this year. Let’s praise the genius of Mary Shelley who took scientific ideas of her time and created a profoundly moving tale that examines what it is to be human. By the way, there was another visitor in Byron’s house in 1816, who is not mentioned in the sonnet; Mary’s stepsister, Claire Clairmont, who had a child in 1817. Byron was the father. *They were married in late 1816, after the famous meeting, but I’ll use the name under which Mary became better known here. Great poem. I especially like the last two lines. Thanks for the background info, too. I’ve always found the circumstances behind the novel fascinating. Thank you Bryan! I rarely write in rhyme, so it’s good to hear it’s not dreadful. It’s hard to believe that such a pivotal meeting could take place today, for some reason. Perhaps because far more people have access to formalised education? I don’t know. Or perhaps there are as many original ideas, but they are lost in the huge number of publications and blogs.